While the issue of grade mislabeling continues to plague the olive oil industry worldwide, actions taken in 2010 by the USDA finally raised the bar for domestic product to worldwide standards. Responding to pressure from within and outside the industry, the USDA published updated criteria for the country’s own classification system with the United States Standards for Grades of Olive Oil and Olive-Pomace Oil. Internationally, most countries use the International Olive Oil Council (IOOC) standards. The IOOC has a United Nations charter to develop criteria for olive oil quality and purity standards. Producers in countries like Germany and Australia are pushing for even more stringent standards that are reflective of unique attributes resulting from terroir and climate, including test parameters for quality and freshness, measured by pyropheophytin (PPP) and diacylglycerols (DAGs). Producers in the Northern European trade have incorporated these testing parameters into their measurements since 2006, but these are not considered widespread requirements for grade definition. In May 2012, the USDA followed up the publication of their new standards with a detailed voluntary program of compliance, a Grading Manual for Olive Oil and Olive-Pomace Oil. The manual defines the standardized process for inspection, testing and authentication and provides a path for authentication and USDA certification through voluntary laboratory testing. The industry has not yet embraced the program, due to its costly and cumbersome process. While the worldwide market recognizes the importance of modern-day standardization for grade definitions of olive oil, arriving at a comprehensive, international standard may become more confusing in the near future, before it becomes clearer. It is important to point out that the USDA standards are only voluntary and non-compliance bears no legal weight. In North America, the Canadian Food Inspection Agency (CFIA) is the only country to have taken any pro-active legal action against the distribution of fraudulently labeled olive oil. With the passage of California State Senate Bill SB634 in 2008, olive oil labeling requirements are now much stronger for products sold in California. The same has happened in Connecticut, New York, and Oregon. Legislators in Massachusetts, New Jersey and Maryland are actively working on similar laws. Many more states are expected to follow. The following provides a synopsis of the grade definitions established in the United States Standards for Grades of Olive Oil and Olive-Pomace Oil, as published in October 2010. Here are the International standards established by the IOOC. Olive oil is the oil obtained solely from the fruit of the olive tree (Olea europaea L.), to the exclusion of oils obtained using solvents or re-esterification processes and of any mixture with oils of other kinds and shall meet the minimum requirements of Table I, found in §52.1539 of these grade standards. Virgin olive oils are the oils obtained from the fruit of the olive tree solely by mechanical or other physical means under conditions, including thermal conditions, that do not lead to alterations in the oil, and which have not undergone any treatment other than washing, decantation, centrifugation, and filtration and shall meet the minimum requirements of Table I, found in §52.1539 of these grade standards. No additives of any kind are permitted. Olive-pomace oil is the oil obtained by treating olive pomace (the product remaining after the mechanical extraction of olive oil) with solvents or other physical treatments, to the exclusion of oils obtained by synthetic processes and mixture with oils of other kinds and shall meet the minimum requirements of Table I, found in §52.1539 of these grade standards. Alpha-tocopherol is permitted to restore natural tocopherol lost in the refining process for refined olive pomace and olive-pomace oil. Maximum level: 200 mg/kg of total alpha-tocopherol is permitted in the final product. 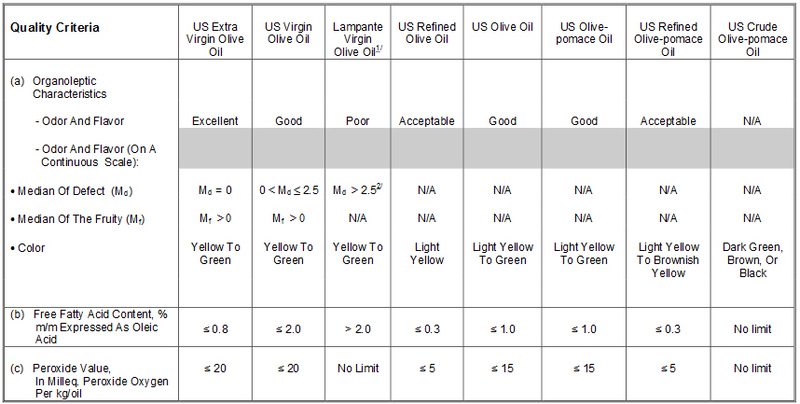 Olive oils are graded based on the minimum criteria outlined in Table I, as appropriate. The hierarchy for grades of virgin olive oil is extra-virgin olive oil, virgin olive oil, and virgin olive oil not fit for human consumption (lampante virgin olive oil). Lampante virgin olive oil is the lowest level of quality among the virgin olive oils and must be refined before consumption. Olive oil and refined olive oil fall below the virgin olive oil category in terms of hierarchy. (a) “U.S. Extra Virgin Olive Oil” is virgin olive oil which has excellent flavor and odor (median of defects equal to zero and median of fruitiness greater than zero) and a free fatty acid content, expressed as oleic acid, of not more than 0.8 grams per 100 grams, and meets the additional requirements as outlined in §52.1539, as appropriate. (b) “U.S. Virgin Olive Oil” is virgin olive oil which has reasonably good flavor and odor (median of defects between zero and 2.5 and median of fruitiness greater than zero) and a free fatty acid content, expressed as oleic acid, of not more than 2.0 grams per 100 grams, and meets the additional requirements as outlined in §52.1539 as appropriate. Olive oil that falls into this classification shall not be graded above “U.S. Virgin Olive Oil” (this is a limiting rule). (c) “U.S. 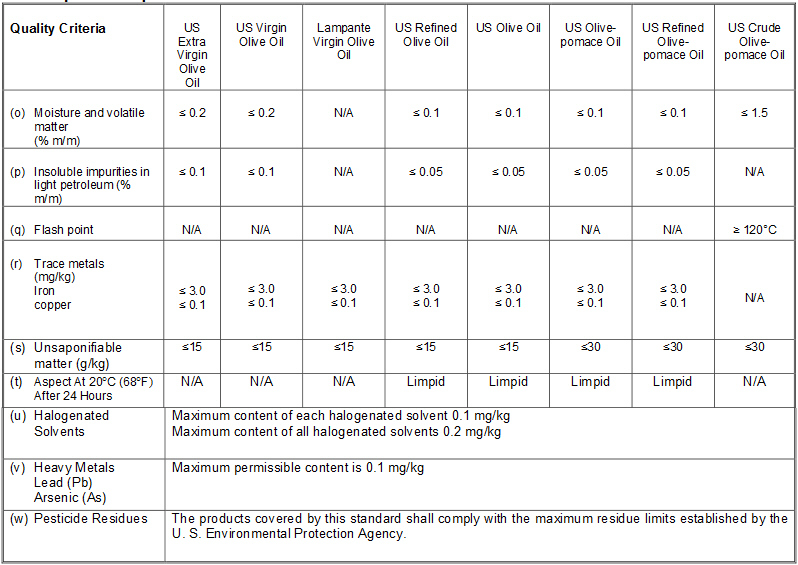 Virgin Olive Oil Not Fit For Human Consumption Without Further Processing” sometimes designated as “U.S. Lampante Virgin Olive Oil,” is virgin olive oil which has poor flavor and odor (median of defects between 2.5 and 6.0 or when the median of defects is less than or equal to 2.5 and the median of fruit is zero), a free fatty acid content, expressed as oleic acid, of more than 2.0 grams per 100 grams, and meets the additional requirements as outlined §52.1539 as appropriate. Olive oil that falls into this classification shall not be graded above "U.S. Virgin Olive Oil Not Fit for Human Consumption Without Further Processing" (this is a limiting rule). It is intended for refining or for purposes other than food use. (d) “U.S. Olive Oil” is the oil consisting of a blend of refined olive oil and virgin olive oils fit for consumption without further processing. It has a free fatty acid content, expressed as oleic acid, of not more than 1.0 gram per 100 grams, has acceptable odor and flavor characteristic of “virgin olive oil,” and meets the additional requirements as outlined in §52.1539 as appropriate. Olive oil that falls into this classification shall not be graded above “U.S. Olive Oil” (this is a limiting rule). The maximum level permitted of total alpha-tocopherol in the final product is 200 mg/kg. (e) “U.S. Refined Olive Oil” is the olive oil obtained from virgin olive oils by refining methods that do not lead to alterations in the initial glyceridic structure (basic glycerin-fatty acid structure). It has a free fatty acid content, expressed as oleic acid, of not more than 0.3 grams per 100 grams, is flavorless and odorless and meets the additional requirements as outlined in §52.1539 as appropriate. Olive oil that falls into this classification shall not be graded above “U.S. Refined Olive Oil” (this is a limiting rule). The addition of alpha-tocopherol is permitted to restore natural tocopherol lost in the refining process. The maximum level is 200 mg/kg of total alpha-tocopherol in the final product. (a) “U.S. Olive-pomace Oil” is the oil comprising a blend of refined olive-pomace oil and virgin olive oils fit for consumption without further processing. It has a free fatty acid content, expressed as oleic acid, of not more than 1.0 gram per 100 grams, acceptable flavor and odor slightly characteristic of olive oil, and meets the additional requirements as outlined in §52.1539, as appropriate. Olive pomace oil that falls into this classification shall not be graded above “U.S. Olive-pomace Oil” (this is a limiting rule). (b) “U.S. Refined Olive-pomace Oil” is the oil obtained from crude olive-pomace oil by refining methods that do not lead to alterations in the initial glyceridic structure. It has a free fatty acid content, expressed as oleic acid, of not more than 0.3 grams per 100 grams, acceptable flavor and odor, and meets the additional requirements as outlined in §52.1539, as appropriate. Olive-pomace oil that falls into this classification shall not be graded above “U.S. Refined Olive-pomace Oil” (this is a limiting rule). (c) “U.S. Crude Olive-pomace Oil” is olive-pomace oil that meets the requirements as outlined in §52.1539, as appropriate. Olive oil that falls into this classification shall not be graded above “U.S. Crude Olive-pomace Oil” (this is a limiting rule). It is intended for refining for use for human consumption or for purposes other than food use. (a) Absorbency in Ultraviolet (UV). Spectrophotometric test which examines the olive oil and measures the absorption under ultraviolet light. These absorptions are expressed as K (extinction coefficient) for the specified wavelength. The two wave length regions are examined, 232 nanometers (nm) to calculate K232 and 270 nm to calculate K270 and 264-274 nm to calculate delta K (∆K). This test provides information on the quality of the oil, state of preservation, and changes brought about through processing. (b) Color. A subjective visual rating to assure that the oil does not have unusual color uncharacteristic of the product. (c) Desmethylsterol Composition. A test used to indicate the origin and purity of the oil. (d) ECN 42 Content. The maximum difference between the actual Equivalent Carbon Number 42 (ECN 42) triacylglycerol content of the oil molecules determined by High Performance Liquid Chromatography (HPLC) and the theoretical amount of ECN 42 triacylglycerol using the fatty acid composition. It is used for the detection of seed oils and verifies authenticity and origin of oils. (e) Erythrodiol and Uvaol. Two triterpenic alcohol components found in olive oil and olive-pomace oil. The levels present differentiate oils that were pressed from oils that were produced by solvent extraction. (f) Fatty Acid Composition. Fatty acids are the molecular components of fats and oils. Basic percentages of fatty acid types are documented for each oil within a certain range. This determination distinguishes between seed oils and olive oil. (g) Flavor and Odor. Refers to the typical flavor and odor of olive oil or olive-pomace oil produced from olives and the degree of positive attributes such as, but not limited to olive, apple, green, sweet, grass, nutty, tomato and some negative attributes, such as, but not limited to musty, fusty, winey-vinegary, muddy-sediment, and rancid. The organoleptic characteristics are based on a continuous scale by a panel of tasters for virgin olive oil exclusively (See Table I). (1) Excellent flavor. Refers to extra virgin olive oil produced from olives, with no defective flavor and having positive flavor attributes, such as, but not limited to olive, apple, green, sweet, grass, nutty, tomato and no negative flavor attributes. (2) Good flavor. Refers to oil produced from olives, with some or no positive flavor attributes and some barely perceptible negative flavor attributes. (3) Acceptable flavor. Characterizes olive oil or olive-pomace oil having little or no flavor. (4) Poor flavor. Olive oil or olive-pomace oil that is off flavor or does not meet the minimum requirement for acceptable flavor. (h) Free Fatty Acid Content. The percent by weight expressed in grams per 100 grams, as oleic acid. The free fatty acid is a measure of the quality of the oil, and reflects the care taken in producing the oil and quality of the in-going fruit. (i) Glyceridic Structure. The molecular structure of fats and oils in the form of various esters corresponding to the reaction of glycerol with fatty acids. The fatty acid groups can replace one, two, or all three of the hydroxyl groups of the glycerol, resulting in mono-, di-, and triglycerides, respectively. Vegetable and animal fats and oils consist of triglycerides. (j) LinolenicAcidisafattyacidcomponentfoundinoliveoil. Its level is used to establish the purity of the olive oil. The fatty acid profile of olive oil and olive-pomace oil is well documented except that linolenic acid limits vary by up to 1.5 percent according to where the oil is grown and harvested. (k) Median of Defects (Md). A calculation of the median score from a panel of tasters or an equivalent scoring method that characterizes the negative flavor and odor attributes of virgin olive oil, such as, but not limited to musty, fusty, winey-vinegary, muddy-sediment, and rancid. (1) Fusty. A flavor defect attributable to poor storage conditions of the olives, usually promoting the bacterial growth of the Clostridium and Pseudomonas genera. (3) Musty. A flavor defect occurring when low temperatures and high humidity promote mold growth, mainly of the Aspergillus and Penicilium genera. The resulting oil has a mushroom-like odor. (4) Rancid. A flavor defect caused by the oxidation of the oil and subsequent formation of aldehydes during the production process giving the oil a varnish, paint, or seed- like flavor and odor. (5) Winey-vinegary. A flavor defect caused by the storage condition of the olives that causes aerobic fermentation by the growth of yeasts that produce ethanol, acetic acid, and ethyl acetate. (l) Median of Fruity (Mf). A calculation of the median score from a panel of tasters or an equivalent scoring method that characterizes virgin olive oil produced from olives, such as, but not limited to olive, apple, green, sweet, grass, nutty, tomato. (m) Organoleptic. Organoleptic analysis consists of an evaluation based on visual, flavor and odor characteristics. (n) Peroxide Value. A measure of the oxidation of olive oil expressed as milliequivalents of active oxygen per kilogram of oil. (o) 2-Glyceryl Monopalmitate Content Determination. This test is used to determine if the oil has been re-esterified by synthetic means or by addition of animal fat. (p) Stigmastadiene. A steroid hydrocarbon found at low levels in virgin olive oil and crude olive-pomace oil. Analysis of its content is used for the detection of refined oils (olive oil, olive- pomace oil, and some seed oils) in virgin olive oil. (q) Sterol Analysis. Used to detect the presence of seed oil. Sterols are one of many minor constituents of oils that are characteristic indicators of impurity of the olive oil. (r) Trans Fatty Acid. When oil is partially hydrogenated or refined, trans fatty acids form in which hydrogen atoms arrange on opposite sides of the double bond. Olive oil in its natural state does not consist of trans fatty acids. This test is used to determine if any processing has taken place such as, deodorization or de-coloring. (s) Triglyceride. A component of oil formed by an ester of three fatty acids and glycerol, oleic acid being chief among them. (t) Wax Content. A determination used to identify the presence of pomace oil or seed oil. Wax content is higher in pomace oil because wax is found in the skin of the olive fruit. 1/ The criteria in (a), (b), and (c) is not required to be concurrent; one is sufficient (for Lampante oil only). 2/ Or when the median of the defect attribute is less than or equal to 2.5 and the median of the fruity attribute is equal to 0. 3/ Limit raised to ≤ 0.3 for olive-pomace oils. 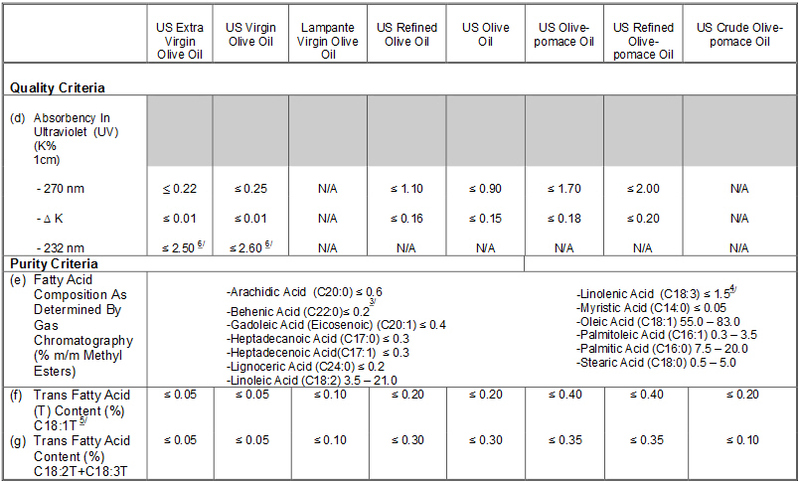 4/ Linolenic acid values between 1.0 and 1.5 percent would be subject to further testing listed in Table II. 6/ Commercial partners in the country of retail sale may require compliance. 7/ Limit raiserd to ≤ 0.2 for olive-pomace oils. 8/ Campesterol values between 4.0 and 4.5 would be subject to further testing listed in Table II. 9/ When the oil has a wax content between 300mg/kg and 350 mg/kg it is considered lampante virgin olive oil if the total aliphatic alcohol content is less than or equal to 350 mg/kg or the erythrodiol + uvaol content is less than or equal to 3.5 percent. 10/ When the oil has a wax content between 300 mg/kg and 350 mg/kg itis considered crude olive-pomace oil if the total aliphatic alcohol content is less than or greater than 350mg/kg or the erythrodiol +uvaol content is less than or greater than 3.5 percent.